A blur of jump rope passes by my eyes and then slaps the pavement. The girls holding the ends of the rope start the counting rhyme. “Down in the valley where the green grass grows, there sat Nancy sweet as a rose, along came Johnny and kissed her on the cheek. How many kisses did she get this week?” “Come on, run in,” they scream. Heart pounding. Body swaying. I hear their calls. “Run in!” I do. Now I bounce up and down as I listen to the rhythm of their counting and the beat of the rope as it whips over my head and repeatedly smacks the smooth asphalt. Sixty-five years later, I still clearly recall this girlhood memory. I’ve made a million other decisions since my playground days. Yet, the precise balance between outer awareness and inner listening are so clear in that moment. This recollection is helping me understand more about living an inner-directed life. Last month, I defined it as a life where we are drawn into action from the core of our being rather than having our actions driven only by outer demands. This month I want to take it one step further. Looking out There, means being aware and curious about our surroundings. We need to take note of requests, demands, expectations that others make. They may or may not line up with what we want. Listening in Here means bringing our awareness inside the body. What are we sensing or intuiting? It is often difficult to put this part into words. We spend little time listening to what is going on at this subtler level. We live in an outward looking culture. One that is suspicious and puts little value on our inner world. To live an inner directed life, we must find out what we really want. This is hard work in a culture that keeps telling us it knows what we should want. Turning inward requires practice. Out there is LOUD! In here often speaks in a whisper. 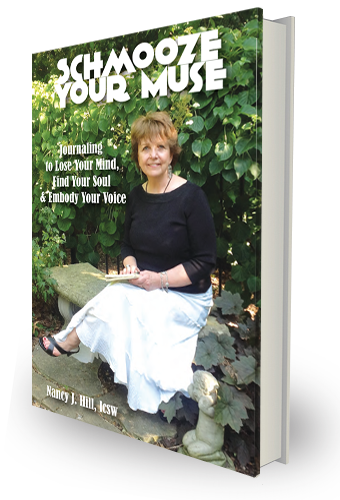 Journaling is one of the methods I use to hear that whisper. I developed a specific practice called “Mindful Journaling” to help others and me to do just that. Paying attention to the senses gives us a map to follow. Scent: Is there a fragrance, or familiar smell? Flowers, garbage, cars, food, tobacco, perfume? Do you smell laundry or bath soap? Can you smell coffee or tea? Is there a scent of rain or burning leaves? Touch: Do you feel the pressure of your body on the chair or cushion? Is there a breeze brushing on your skin? Do you feel the cloth of your clothing touching your skin? Do you sense the changes in your body as your lungs expand to breathe? Sight: What is the setting? Describe where you are. What colors do you see? Are there other people nearby? Do you see trees, plants, animals? Are there cloud shapes? Do you see shadows? Can you see sunshine? Sound: What sounds do you hear? Are there layers of noise? Do you hear your breath entering your body? Hear chatter of nearby people? Machine noise? Music? Birds? Water? Taste: Coffee? Tea? Food? Toothpaste? Is there a sweet or savory taste in your mouth? General Impression: Time of day, the day, month, year, season of year. Let the senses take you inside your direct experience of this moment. Author’s Note: This morning I started to brush my teeth with facial cleanser. No, this isn’t a new tooth cleaning idea. Mindlessly and half asleep, I reached in the vanity and pulled the wrong tube. Ten seconds later my whirring brush flung soap over my teeth and onto my tongue. Yikes, I shirked as I realized what I’d done. This note is to illustrate that paying attention is an ongoing practice. I am still learning. 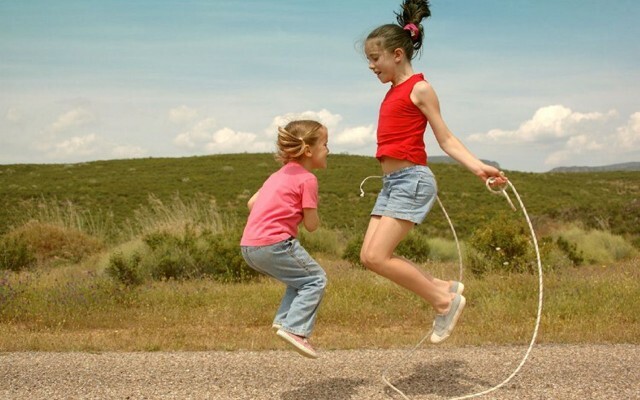 Girlhood moments of jumping rope made it easy to be here now.